As you might remember, Steve and I left St. Barth last month after spending 6 marvelous (and warm) months on the island so that we could attend our grandson Tyler Smyth’s graduation from Xavarian Brothers High School. Tyler is the son of my son and SBP VP, Tom Smyth. We live on Cape Cod in the summer. Returning to the northeast was a bit of a shocker as it was really chilly and, so far, it has not warmed up. I was delighted to have to return to St. Barth to work. 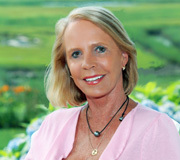 Connie Walsh (no relation) who works with us accompanied me because this is the time of year that we need to gather information for the new edition of our Live Your Dream catalogue and Connie helps me write the content. We had lots of interviews to do. As it turns out, I also had new villas to inspect, so the week was quite hectic but profitable because most of what I saw, I liked. I thought you would enjoy staying in anyone of them, depending on your needs and budget so we are adding them to our portfolio. 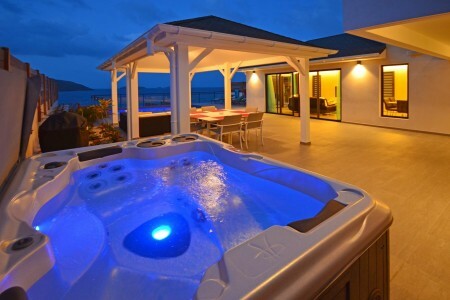 I will be presenting them to you in future blogs but the villa I am featuring today is Villa Brume de Mer. Connie and I were fortunate to be able to spend 3 nights in this brand new two bedroom villa that is located just past the far end of Flamands Beach, a favorite of so many. It’s a classic wide Caribbean beach with sugar white sand and some surf. You can walk to it easily from Brume de Mer. It takes about 3 minutes. 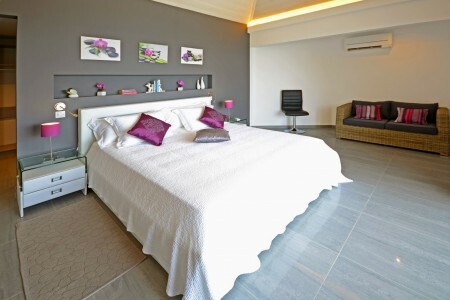 Stroll to the other end where you will find the five star hotels, Cheval Blanc St-Barth Isle de France and the Taïwana. Stop info a drink or perhaps a leisurely lunch or gourmet dinner. If you enjoy Creole food and fresh Caribbean Lobster (Langouste) enjoy lunch or dinner at the casual, reasonably priced La Langouste restaurant. Brume de Mer sits on a bluff overlooking the Baie de Flamands; we loved listening to the sound of the surf while we were sitting in the outdoor living area and typing away on our laptops. As the sun was setting, I turned on the pool light and was dazzled by the ever-changing colors we saw. 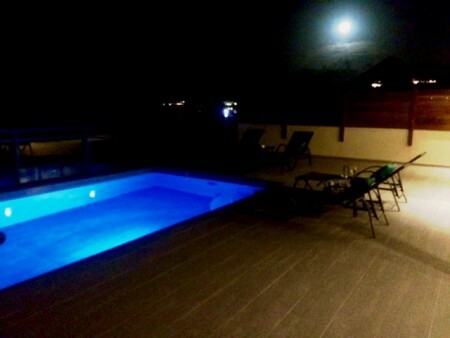 We watched the solar heated pool at Brume de Mer change colors under the full moon while we were there. This blue one is my favorite. The air-conditioned living area, dining area, and kitchen are glass enclosed with sliders that open if you prefer to have breezes instead of using the AC. My bedroom, located on the main level has a king bed that can be converted to twins which is ideal if you are vacationing with your children. The bathroom has two doors. 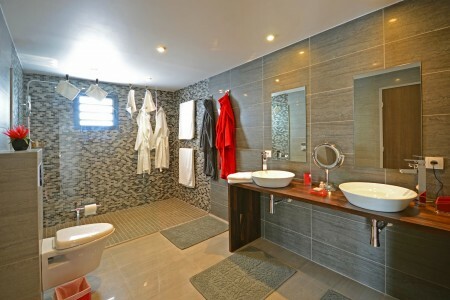 It is en suite if you access it through the bedroom and walk-in closet or it can serve as a guest bath if you access it from the kitchen area. It has double sinks and a delightful rain head shower. Connie stayed in the upstairs bedroom. 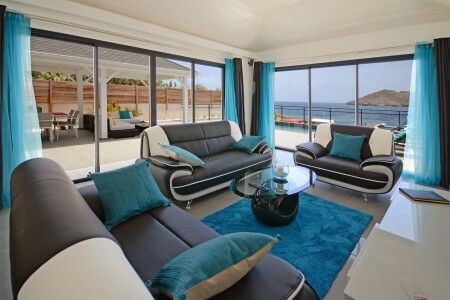 It features a king bedroom with a loveseat and an outdoor balcony that looks out to the sea. It too has a walk-in closet and two accesses to its en suite bathroom. I wish that we could have spent much more time enjoying the villa but we were on a working trip and running around the island like crazy. I do know that you will love it. 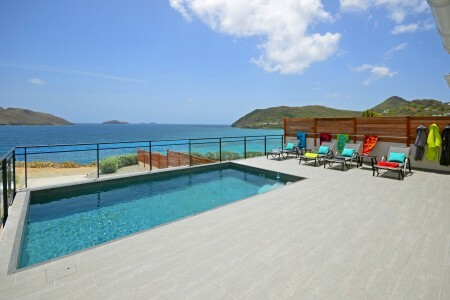 The villa is exclusively listed with St. Barth Properties, so if you would like to experience Villa Brume de Mer, just contact me at pegwalsh@stbarth.com, mention that you read this blog and I will pay the 5% island tax for you. Don’t forget to tell me how much you enjoyed you stay! See you in St. Barth. This entry was posted on Thursday, June 11th, 2015 at 12:16 pm	and is filed under St. Barth Trips, Villas. You can follow any responses to this entry through the RSS 2.0 feed. You can leave a response, or trackback from your own site.